Very often, once I find a saddle that I like alot, I will tend to stick to it. 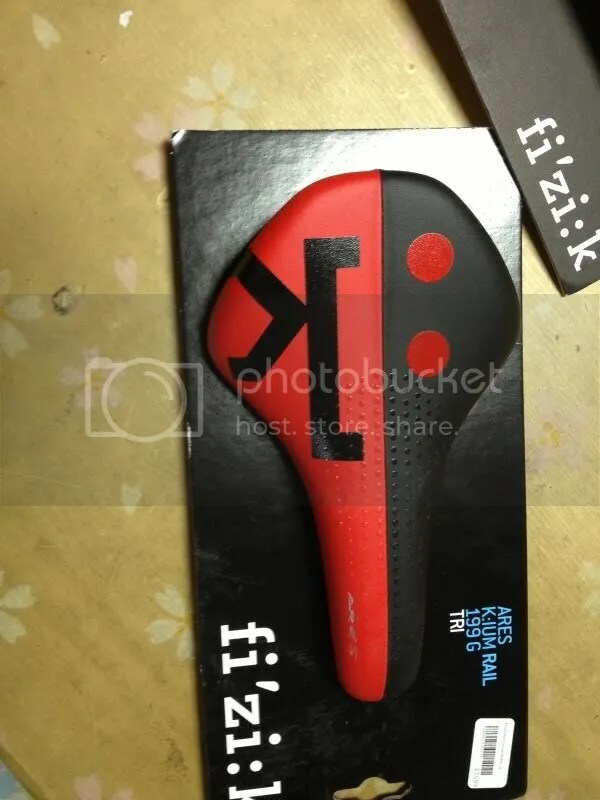 In this case it is the Fizik Antares.Putting it on the tri/tt bike however would mean that the bike would most likely contravene the UCI saddle rule. Thus, the Ares comes into the picture. 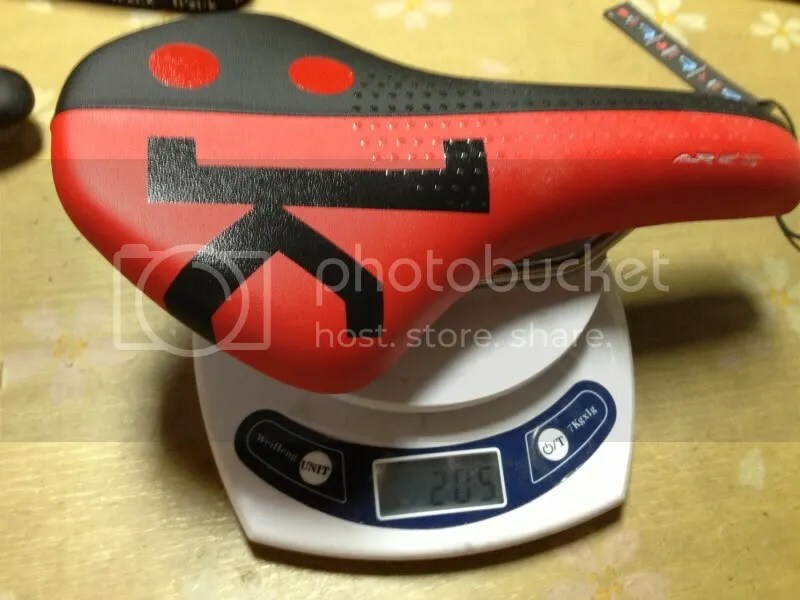 Here is the saddle, mine came in at 205grams,not that the weight is important. The key feature of the Ares is that it is the stubbier, fatter looking brother of the two. It was specifically designed to meet the UCI (saddle nose must be 5 cm behind the bottom bracket) Rule. Compared to the Antares below, the nose is definitely shorter. The saddle shape for the rear is exactly the same as the rear of the Antares. The saddle nose has the extra padding for those long aerodynamic position. It is the saddle of choice of Dave Zabriskie(he even uses it on his road bike) And mine came in the “Garmin-Cervelo” colour of red and black.One thing which I found funny was the fact that it weights heavier than the Antares though it is shorter, which could be perhaps due to the fact that the nose has a ton of padding. The most important question: How does it feel ? On the road bike, I like the Antares for being comfortable yet not having a thick padding. It’s long nose and fat base means that I am able to adapt a variety of riding position and able to change it without much fuss. On the Tri Bike however, most of the time I am on the aerobars, this means leaning forward on the saddle nose most of the time.Its thick padding means comfort for the junk though it may be awkwardly pushed to one side. Its padding however is thinner than the previous saddle which I have which is the San Marco Ponza TT. Should I feel some numbness in the groin area, I am able to ride on the rear of the saddle comfortably whilst on the aerobars, something which not many saddles are able to offer. For the trip back home, sitting on the rear while holding onto the base bar is comfortable. While saddle are still very personal choices,my recommendation is that should you use the Antares(and find it comfortable) and intend to get a TT bike,you might want to consider upgrading the saddle to the Ares.It is difficult to find this saddle in Singapore as the distributor does not carry it.As for now, this will be my preferred choice saddle on my tt bike.One weakness of it is the lack of colour being only available in red,black and red/black. However, for comfort,I am willing to sacrifice the mismatch of color on any bike. 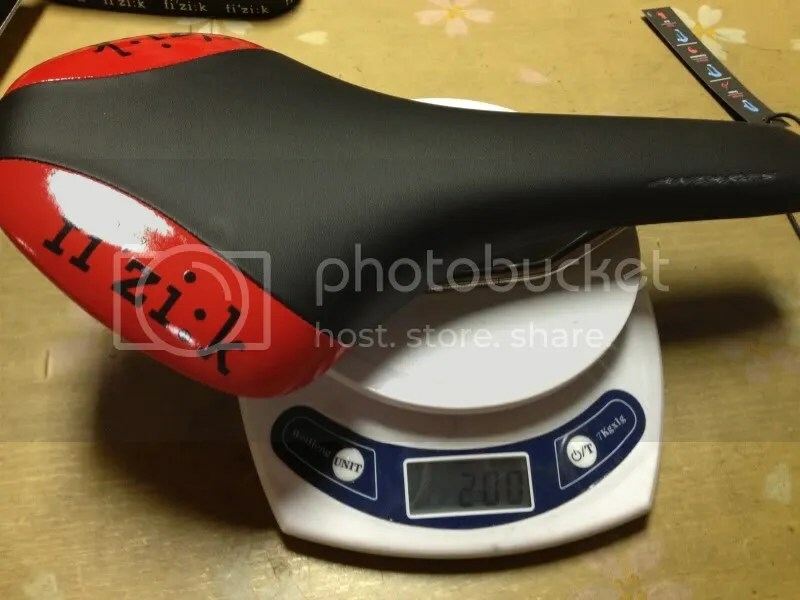 This entry was posted in Upgrades and tagged Ares, Fizik, Time trial saddle, Tri saddle. Bookmark the permalink.